The NHL playoffs didn’t disappoint as they got kicked off last night with some exciting finishes, including a roaring come back by the the Columbus Blue Jackets. The Tampa Bay Lightning are now down 1-0 in their first round series after dominating the entire league during the regular season, and will have immense pressure to get back in the win column tomorrow night. For today, three games are on the schedule starting with the Toronto Maple Leafs and Boston Bruins reviving their rivalry. As teams prepare for this action we’ll be here keeping track of all the minor moves. The Washington Capitals have recalled goaltender Ilya Samsonov from the Hershey Bears. The 22-year old Samsonov will serve as the team’s third goaltender during the playoffs, a pretty big blow to the hopes of the Bears who have already locked up a playoff spot. Samsonov posted just an .896 save percentage in 36 games with the Bears this season, but is one of the top goaltending prospects in the world and has all the ability to put together a long AHL playoff run. 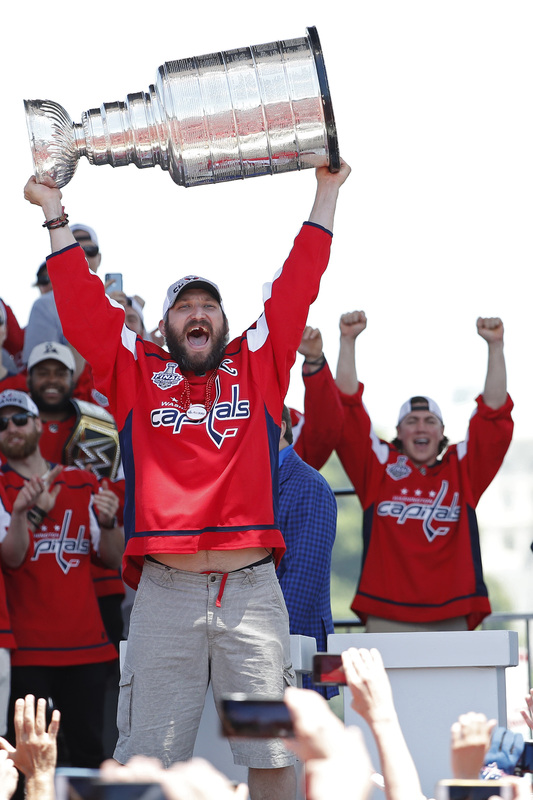 Instead, he’ll work with the Capitals and allow Braden Holtby to get some rest in practice if needed. Adam Clendening has been returned to the Cleveland Monsters, giving him a chance to suit up for the team tonight between NHL playoff matches. Clendening is serving as an extra defenseman for the Columbus Blue Jackets, but will likely bounce back and forth as the Monsters try to secure a playoff spot. Simialrly, Cameron Gaunce was sent to the minor leagues by the Tampa Bay Lightning to help out the Syracuse Crunch. Gaunce had 43 points 57 games for the Crunch this season, his best year yet in the AHL. While the Sabres will likely try to add to their roster between now and the trade deadline as they continue to chase down a playoff spot, their focus at the moment is dealing with one of their own players. In an appearance on WGR 550 (audio link), TSN’s Darren Dreger indicated that the top priority for GM Jason Botterill is getting an extension done with pending UFA winger Jeff Skinner. The 26-year-old is among the league leaders in goals with 30 and is on pace to set new career highs in goals and points. That has him poised to land a significant raise on his current $5.725MM AAV, something that Buffalo would clearly like to have wrapped up sooner than later. The Bruins have a pair of distinct needs in a third line center and a second line winger. Fluto Shinzawa of The Athletic suggests (subscription required) that the strong showing from recently-recalled winger Peter Cehlarik should help push Boston in the direction of addressing the vacancy down the middle first. While he’s only a couple of games in, the early returns are promising while the team has other young players that they can use on the wing in the top six if need be. However, that depth isn’t as plentiful at center and if GM Don Sweeney only has enough trade capital to address one of those holes, Shinzawa believes it should be that one. Cehlarik continuing his strong start would make that decision much easier. It has been a rough first season in North America for Capitals goalie prospect Ilya Samsonov. He has posted a 3.40 GAA and a .871 SV% in 19 games with AHL Hershey but the team doesn’t appear to be too concerned. 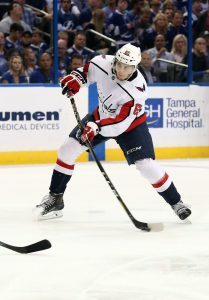 Speaking with reporters including J.J. Regan of NBC Sports Washington, GM Brian MacLellan stated that Samsonov is about where they expected him to be in his rookie year, acknowledging that they figured he’d be up and down throughout the year. Based on how he has performed though, it’s hard to envision them bringing him up for next season with Pheonix Copley set to become an unrestricted free agent so Washington will likely have to either re-sign or replace Copley via the open market this summer. Nine games grace the NHL stage tonight including some key matchups featuring some of the best teams in the league. Perhaps the best example of that is when the Tampa Bay Lightning visit the Nashville Predators in a battle of Stanley Cup contenders. As teams prepare for their big night, we’ll be right here keeping track of all the minor moves. The Washington Capitals are expected to have Braden Holtby dressed once again as he returns from injury, and have sent Ilya Samsonov back down to the minor leagues. Taking his place on the roster is young defenseman Jonas Siegenthaler, who has played two games for the Capitals this season. Samsonov is one of the top goaltending prospects in the world, but will have to wait for his next opportunity before making his NHL debut. Micheal Haley is back with the Florida Panthers, as the team recalled him today along with Dryden Hunt. Denis Malgin and Maxim Mamin were reassigned to the Springfield Thunderbirds to make room. Haley, 32, spent the start of the season away from the team working with the NHL/NHLPA player assistance program, but has now resumed his career and will try to inject some physicality and energy into the Panthers lineup. The Arizona Coyotes have returned three players to the AHL as they make room for other on the roster returning to health. CapFriendly reports that forward Mario Kempe and defensemen Dakota Mermis and Robbie Russo have all been reassigned to the Tuscon Roadrunners. Russo did not see any game action on his first recall of the season, while Mermis skated in just over eleven minutes in his one appearance and Kempe recorded a team-low 10:22 ATOI in four games. The trio don’t seem to have the trust of the coaching staff just yet and the Coyotes likely hope that they can stay healthy enough to avoid seeing any of the group for a while. The NHLPA hosts a Rookie Showcase every season for the players recognized as the most likely to make an impact at the NHL level in the near future. Some of these names have already played a few games in the league, but many are still waiting for their first opportunity to suit up as professionals. This group is not a ranking of the top prospects in the league and is missing several names that would be included in such a list. Still, it gives a glimpse at the next generation of NHL stars.